The fact that George W Bush has given Michelle Obama two pieces of candy is once again making headlines in mainstream outlets like Time, The Hill, and Newsweek. He has not given her any new pieces of candy since the last time he did so at his father’s funeral. He also has not ceased to be the man who facilitated the murder of a million Iraqis and inflicted a whole new level of military expansionism and Orwellian surveillance upon our world. As near as I can tell, the only reason this story is once again making headlines is because Michelle Obama and the mainstream media have decided to bring it up again. “He has the presence of mind and the sense of humor to bring me a mint, and he made it a point to give me that mint right then and there and that’s the beauty of George Bush,” Obama said of the war criminal in conversation at the SAP Center over the weekend, which we apparently need to know about because the news is telling us about it. “We’re all Americans. We all care about our family and our kids, and we’re trying to get ahead,” Obama continued. If you’re starting to feel like attempts to rehabilitate George W Bush’s image are being aggressively shoved down your throat by the mass media at every opportunity, it’s because that is exactly what is happening. Every few weeks there’s a new deluge of headlines explaining to consumers of mainstream media why they should love the 43rd president because he’s such a cutesy wootsey cuddle pie, and completely forget about the piles upon piles of human corpses he is responsible for creating for no legitimate reason at all. The last Bush appreciation blitz was less than two weeks ago. And there is a reason for this. Make no mistake, this relentless, aggressive campaign to rehabilitate George W Bush whether you like it or not is actually a campaign to rehabilitate what he did and the mass media’s unforgivable complicity in it. The mass media failed spectacularly to practice due diligence and hold power to account in the lead-up to the illegal and unconscionable Iraq invasion, not just the ghouls at Fox News but respected centrist outlets like CNN, the New York Times and the Washington Post as well. Bogus government reports were passed on uncritically and unquestioned, antiwar demonstrations with hundreds of thousands of protesters were ignored and downplayed, and the words “Saddam Hussein” and “9/11” were deliberately mentioned in the same breath so frequently that seven out of ten Americans still believed Saddam was responsible for the September 11 attacks months after the Iraq invasion had occurred. In an environment where the New York Times is instructing its readers how to “help fight the information wars” against Russia, the BBC is coaching its audience to scream the word “whataboutism” whenever a skeptic of establishment Russia narratives brings up Iraq, and the US Secretary of Defense is claiming that Putin is trying to “undermine America’s moral authority,” the massive credibility hit that imperial media and institutions took by deceiving the world into the destruction of Iraq matters. Propaganda is a lot more important in cold war than in hot war since avoiding direct military confrontation limits the options of the participants, and Iraq is a giant bullet hole in the narrative of US moral authority which Moscow is rightly all too happy to point out. Without the claim of moral authority, none of America’s manipulations against Russia make any sense. It’s absurd for America to spend years shrieking about Russian election meddling after it openly rigged Russia’s elections in the nineties, unless America claims that it rigged Russia’s elections for moral reasons while Russia rigged America’s elections for immoral reasons. It makes no sense to have mainstream western media outlets uncritically manufacturing support for wars and coaching their audiences on how to help government agencies fight “information wars” against Russia while also criticizing RT as “state media”, unless you can say that western media functions as an arm of the US government for moral reasons while RT does so for immoral reasons. It makes no sense for the US to criticize Russian military interventionism when the US is vastly more guilty of vastly more egregious forms of military interventionism, unless the US can claim its interventionism is moral while Russia’s is immoral. For this reason it’s been necessary to rehabilitate the image of the Iraq invasion, and since there is no aspect of the Iraq invasion itself that isn’t soaked in blood and gore, they are rehabilitating its most recognizable face instead. Mainstream media outlets are doing this both to restore their own credibility and the credibility of the US world order they serve, in order to help secure crucial narrative control as we slide ever closer to a direct military confrontation with Russia and/or China. Whoever controls the narrative controls the world, and Iraq is a major weak point in the US-centralized empire’s narrative control. 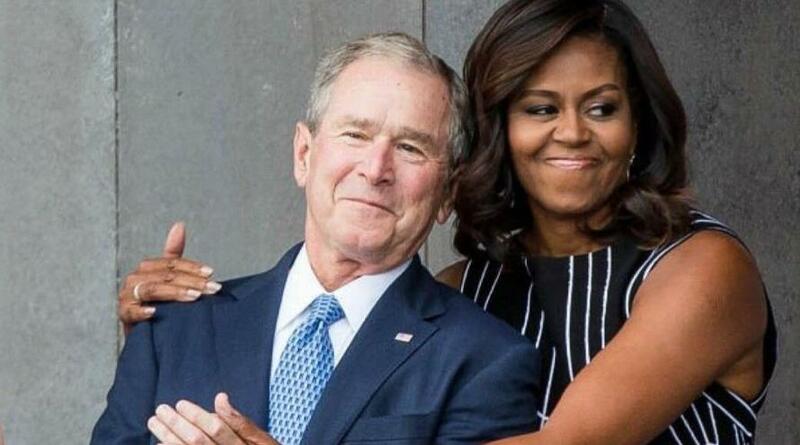 When you see a political insider like Michelle Obama constantly facilitating the mass media’s fixation on how cuddly wuddly George W Bush has become, you are not witnessing a heartwarming moment, you are not witnessing redemption, and you are most certainly not witnessing the news. You are witnessing war propaganda, plain and simple. That was fun. So, the best way to get around the internet censors and make sure you see the stuff I publish is to subscribe to the mailing list for my website, which will get you an email notification for everything I publish. My articles are entirely reader-supported, so if you enjoyed this piece please consider sharing it around, liking me on Facebook, following my antics on Twitter, throwing some money into my hat on Patreon or Paypal, purchasing some of my sweet new merchandise, buying my new book Rogue Nation: Psychonautical Adventures With Caitlin Johnstone, or my previous book Woke: A Field Guide for Utopia Preppers.